Is the Vision X40 Elliptical a Good Non-Folding Trainer for the Home? The X40 is the non-folding version of the XF40, and together the two models make up Vision's traditional elliptical lineup, alongside their popular Suspension series. With high end components and ergonomic design, the X40 stands right up there with the elite brands. The Vision X40 gives you three different choices when it comes to consoles, so you can choose the one that most appeals to you. The Classic has a large LED screen; the Elegant + and Touch + have touchscreen technology. Check out the X40 Elliptical on Sale at the Vision Store Now! Vision ellipticals always receive positive reviews from the experts, as they are well constructed and designed to create the most natural range of motion. Johnson Health & Fitness, the parent company of Vision, is a well-regarded company and the second largest equipment manufacturer in the world behind ICON Fitness. They also make other popular brands including Horizon, AFG and Matrix. The X40 continues that tradition with commercial-grade components, oversized, ideally-spaced pedals, 23-lb flywheel and eddy current magnetic resistance. As we mentioned, it is one of only two traditional elliptical offerings from Vision, alongside the nearly identical XF40 folding model, with a nice set of features. You get a 20" stride, 20 resistance levels, grip and wireless heart rate monitoring capability and Passport HD video technology. But the most appealing feature of the Vision elliptical lineup is definitely the console choices, which gives you the flexibility to choose the features that most appeal to you. 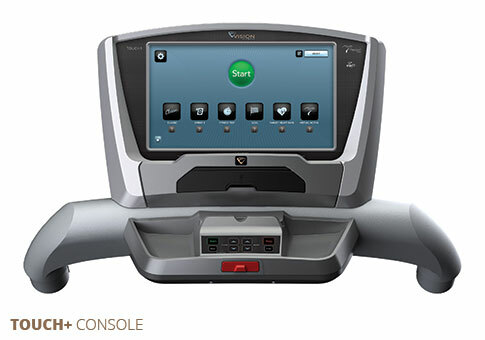 The basic, Classic Console features an LED display, 7 workout metrics and 5 programs. Stepping up to the Elegant + Console you get a 7" HD touch screen, 19 workout metrics, 13 programs including their patented Sprint 8 interval training, ViaFit tracking, Virtual Active videos and a free wireless heart rate monitor. At the top of the lineup is the Touch + Console, with a 10" HD touch screen, 19 workout metrics, 17 programs and iPod/iPhone integration with speakers. You'll pay about $400 more for the Elegant and $900 more for the Touch, so you have to decide if it's worth the extra money for you. The two advanced consoles do give you a lot more features and capabilities. The Vision X40 elliptical trainer is a solid machine that has been well received by users. It is expensive but you get a lot for your money. 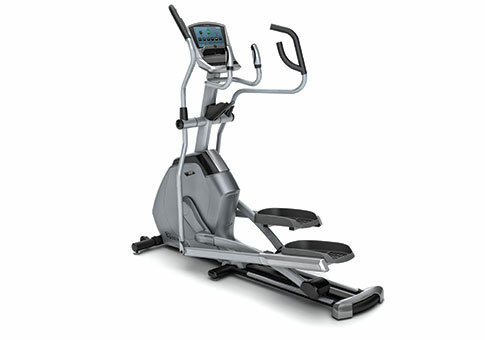 We like the Vision ellipticals, as we do Johnson's lower end Horizon brand. The company makes a very good product, and is focused on customer satisfaction. The X40 is a very good choice if you can afford it, especially the touch consoles which feature the latest technological advances. You get a lot of workout programs, accurate wireless heart rate monitoring, Virtual Active/Passport HD training videos, ViaFit tracking and sharing and plenty of comfort features. If you are considering a folding machine, look at its sister model, the XF40, which is pretty much the same machine in a foldable version.